In Australia, every horse has its birthday on the first day of August each year..
All thoroughbreds have the same birthday so that their ages can be standardized for comparison because of the historical lack of records of actual birthdays. All thoroughbred horses celebrate their birthday on the same date, January 1 in the Northern hemisphere and August 1 in the Southern hemisphere. After the first time a horse is alive on August 1st it is considered a yearling. The next August 1st is it's 2nd birthday and it is considered 2 years old, even though it could conceivably be one year one day old. 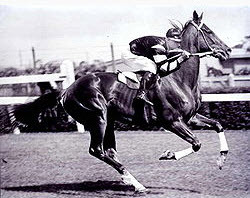 Today we like to remember 'Big Red' better known as Phar Lap. Phar Lap (1926-1932) was a champion thoroughbred racehorse whose achievements captured the public's imagination during the early years of the Great Depression. Foaled in New Zealand, and brought to Australia, Phar Lap dominated Australian racing during a distinguished career, winning a Melbourne Cup, two Cox Plates and 19 other weight for age races. He then won the Agua Caliente Handicap in Tijuana, Mexico in track-record time in his final race. After a sudden and mysterious illness, Phar Lap died in 1932. At the time, he was the third highest stakes-winner in the world. His mounted hide is displayed at Melbourne Museum, his skeleton at Museum of New Zealand Te Papa Tongarewa and his heart at the National Museum of Australia in Canberra.